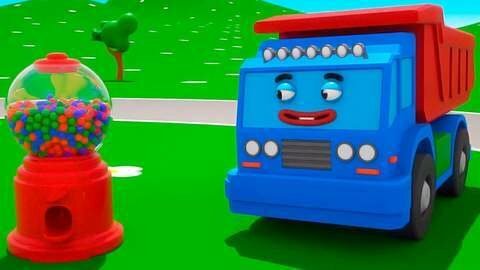 In this episode of 3D car cartoons, the 3D cars and the dump truck helps kids learn colors using the gumball machine. The blue dump truck presses the button to release colorful gumballs that the 3D trucks blow up. See the ambulance bounce on the bubble and the police car float away with the balloon in this funny video. Make sure to catch other fun and educational free videos at SeeZisKids.com.